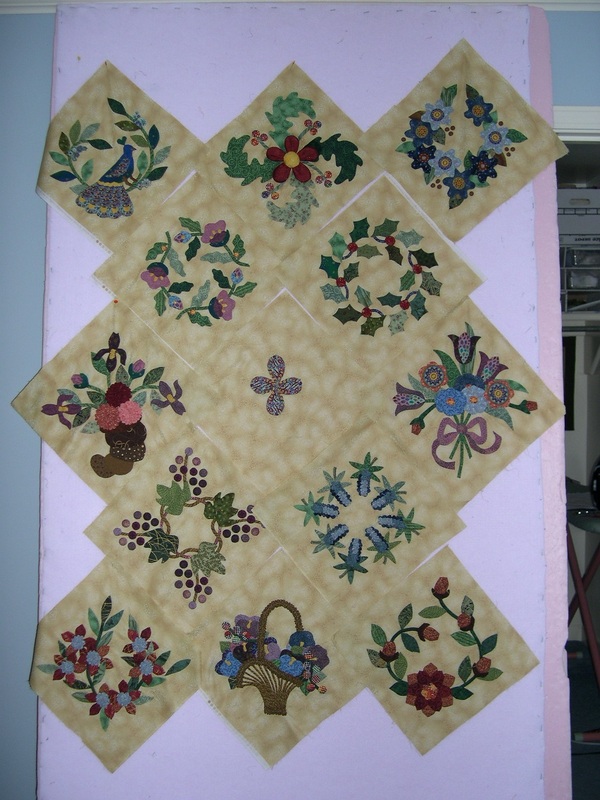 I could not make quilts without my design wall. When I make fabric choices or arrange blocks I put them on my design wall. Then I step back, way back, and consider how my choices look. Ideally after I have made a decision I will leave it on the wall for at least a day to make sure it really does work. Here I used the wall to arrange the blocks for my Conway Album. Irma Gail's blocks are arranged for balance of color and shape. But once I made mine I had to rearrange their placement to spread out the colors evenly. The middle top, middle bottom, and middle side blocks will remain like the original. 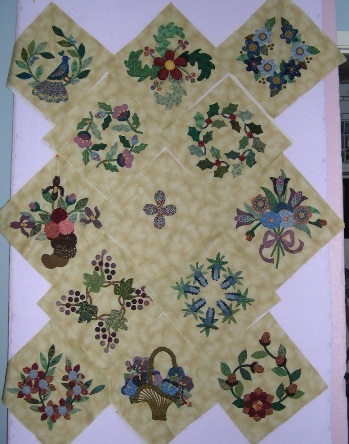 The other side blocks which are all wreaths will be rearranged but stay in one of the four positions. And I have done the same with the four corners. Two of those have been turned upside down to balance with the opposite corner. After doing this I found I had to change the color of the princess feather flower. Better to change now than be displeased after the quilt is done. I have two of these design walls which are very portable. I bought two of the thicker 4x8 foot sheets of polystyrene, aka foam board insulation, from Home Depot. (If you have 8 foot ceilings, cut off about 6 inches from the tall side.) I used a staple gun to attach a thick, white cotton batting to one side of the boards. I can easily take them from my sewing room to the living room when I have quilt meetings at my house. They have been great for show and tell. They are even portable to someone else's house if you have a van to haul them in.